We often get the reaction, “But you are women, how can you style men?”, but boy we love our job. We feel women are best suited to style men, as they really know what women want. For us there is nothing better than a well dressed, well poised man. And we got to style not 1 or 2 but 3 absolutely gorgeous stars at the AFA16 Red Carpet. The three styles were distinct, they all held their own very well and the best compliment we got for the night from Varoin Marwah (Indian Menswear Designer) was how we took three looks that were completely different from one another and the boys made them their own. Our star celebrity and a SiddySays Styles favorite, Junaid Khan is blessed with the perfect height, physique and face. He has a very sophisticated personality if you get to know him, but at heart he is a real rockstar who can bring the house down with his power packed live performances. 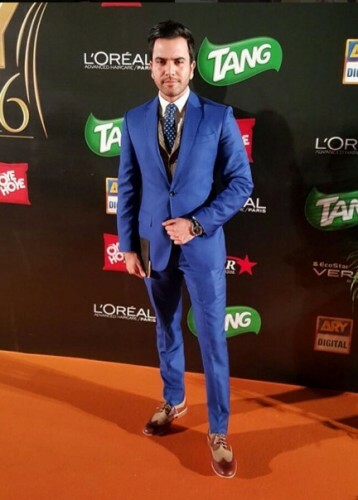 In this look he is sporting an Egyptian blue suit made to perfection by Munib Nawaz. Paired with a notch lapel peanut brown gingham print check waistcoat and a crisp white shirt, the look is finished off with a matching blue micro printed paisley tie. The two toned brogues create a balance between the waistcoat and accessories. To make him look every bit the class act that he is, JK was wearing a black dial Omega Seamaster watch by AMPMPakistan.